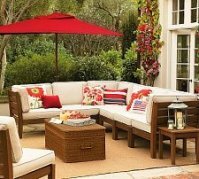 Patio Materials are Available in a Wide Array of Choices. These aren't your father's patio materials. In times gone by, a concrete patio meant a basic gray concrete slab, with a broom finish. If you wanted fancy, you could get some nice edging design added. My how times have changed. Concrete is available in essentially any color you can imagine, and with stamped concrete, you can select almost any look you want. Cobblestone, tile, river rock, even concrete that looks like wood. You can vary the "grout" color, completely changing the look. But there really is no grout - it's a solid concrete slab! Of course, you can still get a basic gray slab - it's quite a bit cheaper. Stamped concrete is not usually stained - the color is added while it is being mixed, so it goes all the way through. If you already have a basic concrete patio, you can acid stain it to add color and interest. This method doesn't provide quite as much depth as the stamped concrete, but it can still be quite stunning. Your color options are also more limited, but there are plenty of earth tones available to suit most any application. So don't tear up your existing plain concrete patio. Acid staining can give you a great deal of the appeal of these other patio materials without the expense and effort. Pavers are one of the most interesting patio materials you can use. 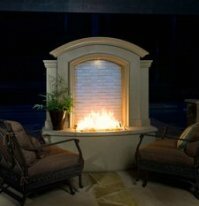 They can be installed over a sand or gravel base, and can be grouted with mortar, sand, or not at all. Interlocking paver stones are best if you don't want to grout. A wide variety of colors and styles are available. This style lends itself to do-it-yourselfers, but it is time consuming. 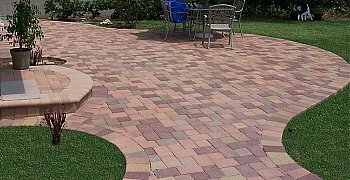 Pavers are very strong and are easy to repair in the event of damage or a stain. Plants can grow in the sand grout and ants may use them as triffic ways. Both of these issues are treatable with plants killers or insecticides. 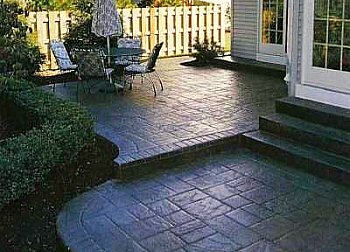 Pavers are actaully stronger than concrete and have the advantage of being movable, should you ever decide your patio belongs elsewhere. Tile can be laid over a concrete slab to create an elegant high end look from a plain patio slab. Many new homes come with a basic concrete slab. If yours did and you want to dress it up, this may be the answer for you. Tile is available in a huge array of colors and styles, made even larger by the contrasting grout colors available. Interesting patterns and murals increase your tile options. This can be a do-it-yourself project as well. Terra Cotta tile creates a classic, warm, earthy feeling. 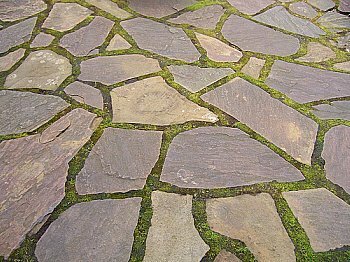 Flagstone is another beautiful and unique option for patio materials. Flagstone can be quite large and heavy, so have help if you want to do-it-yourself. And yes, you can do this yourself. But, (yes, there's always a "but", right?) if you don't do it right, you can create a mess that could cost a lot more to fix than it would have to hire a pro to begin with. I encourage you to check out this "how to" guide from an experienced flagstone installer before you take the project on. It is well worth the modest cost to avoid the mistakes you'll likely make without this information. And yes, if you purchase the guide - I will receive a commission. I would recommend it either way, but I have nothing against getting paid at the same time. So check out the product and if you agree that it will help you, buy it! To preview it - Click Here! 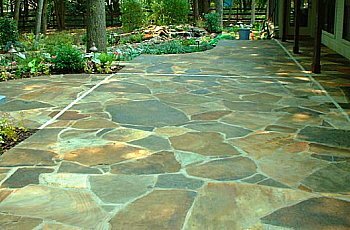 There are two ways to install flagstone; Wet installation meaning it is laid in concrete mortar and grouted with mortar, or Dry installation where it is laid in sand or gravel and grouted with the same material. Many folks prefer the dry method since it is a bit more rugged looking in keeping with the stone itself. 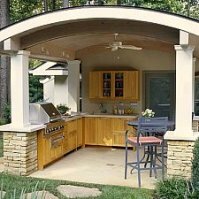 Dry installation also results in a patio that can be easily repaired and even moved.